On Friday, April 6, NMA held its annual Member Meeting. This meeting was held in conjunction with the annual conference featuring Dr. Michael Saini. NMA’s Board President, Casey Karges, introduced the current board: Joan Sabott, Vice President; Jay Wilson, Treasurer; Debra Blue, Secretary; Dan Beckwith; Mary Lee Brock; Melissa Johnson; Susan Koenig; Jane Martin-Hoffman; Lori McKeon; Larry Scherer; and Kandi Weinbender. This is the time of the year that we recognize those Board members whose terms are ending. It is with deep gratitude that we say thank you for your service to two board members: Mary Lee Brock and Debra Blue. Mary Lee has served six years, including fulfilling the role of Board President and serving on the Member Services Committee. She was instrumental in implementing and facilitating Case Reviews in which members across the State came together to discuss cases, framed to protect the identities of the parties. These online gatherings are an excellent way to process, learn, and connect. Debra has served three years, including fulfilling the role of Secretary and serving on the Members Services and Annual Meeting Committees. Debra contributions to the Association have been invaluable. She is dedicated and always willing to do whatever is needed to ensure success. Debra has been involved with the Annual Conference since before becoming a Board member and, thankfully, she will continue to be involved. The NMA Board of Directors is comprised of 12 members that are elected by the membership. Per our bylaws, Article 8 Section 2: The directors shall be elected in the following manner: 4 directors, each of whom is either a staff member of or is an affiliated mediator of an ODR-approved mediation center shall be elected by the MC (Mediation Center) class; 5 directors elected by the M (Mediator) class with at least 1 with a primary residence in the western part of the state (west of the eastern boarder of Cherry, Thomas, Logan, Lincoln, Frontier, and Red Willow counties); and 3 at-large directors elected by all members (MC, M, S [Supporting]). All directors shall be members of the Corporation. Per the vote of the membership, we welcome Mary Rose Richter and David Hubbard to the NMA Board of Directors. They will serve a three-year term and can elect to run in 2021 for a second three-year term. 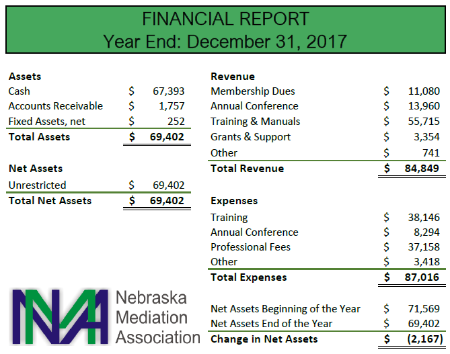 Jay Wilson, Treasurer, provided an overview of NMA’s finances. To supplement his report, the 2017 year-end financial report is being provided. This past year, the Legislative Committee has been very active. At the beginning of the 2018 session, a committee member was assigned to each day as legislation was introduced and identified all bills that may have an impact on our profession. This committee monitored bills identified, met regularly to discuss, and write legislative updates to share with the membership. The Committee hopes that members found this information useful. The Committee has requested that the Board discuss possible legislative positions to be taken by NMA. Currently, the Committee monitors bills which means they track a bill’s progress due to its potential impact on the practice of mediation. This coming year, the Board will address if NMA should monitor with comment which expands the monitoring position by having Legislative Committee members convey comments of the NMA to the introducer of the bill and the committee that is considering the bill. Testimony on the bill would neither support nor oppose the legislation but would inform the committee of the comments of the NMA. The Board will also discuss if NMA should take a position on bills to support or oppose. Please contact a Legislative Committee member (Diane Amdor, Casey Karges, Larry Scherer, Sharon Schmidt, Kelly Riley) to share your thoughts on NMA’s role in regard to Nebraska legislation. NMA recently has begun strategic planning that will lead into a marketing plan for the Association. The Association is eight years old and does not have a defined marketing plan. When the Board started work on this with the assistance of Kathleen Overholt, we determined that there were some strategic questions that needed to be answered before we could move forward with the development of a marketing plan. Three workgroups were developed to continue this strategic work, including: 1) mission statement review, 2) content development/dissemination, and 3) expansion. From this strategic work, the Board will work with our consultant, Kathleen, on developing an appropriate marketing plan. In addition to Kathleen being familiar with our profession (she has a Master’s Degree in Negotiation and Conflict Resolution from Creighton University), her professional background is in marketing. We are very excited to see where this process leads the us!